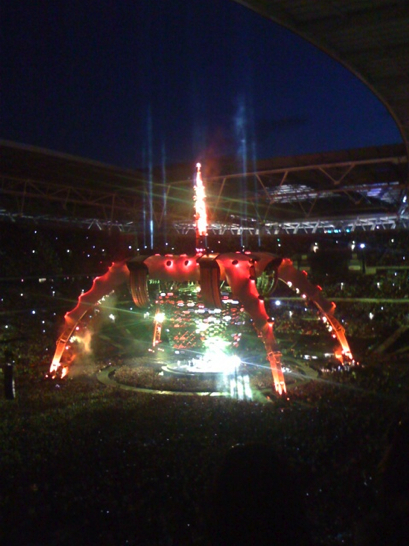 U2 bring their 360 production into London for the first of two shows. Tonight Wembley stadium will welcome its biggest crowd ever, with 88.000 people attending (former record holders: Rod Stewart in 1995 and Foo Fighters in 2008, both played in front of 83.000 people). Total attendance over two shows is estimated 170.000. Mysterious Ways and Your Blue Room were played in full during soundcheck, as well as fragments of Beautiful Day and Get On Your Boots. Support acts for this first night are The Hours and Elbow. Among the celebrity guests spotted in the star studded capital are Noel Gallagher, Lars Ullrich, Richard Curtis, Bill Nighy, Roman Abramovich, Will Champion, Brian Eno, Paul Greengrass & Neil McCormick. All video courtesy of the great u2006.com, except * by Liamjd2008.